One of the most common issues people bring in therapy is lack of confidence. Whether it’s confidence in themselves or confidence in doing something. And that is generally closely linked with a lack of self-esteem. But what’s the difference between self-esteem and self- confidence? My interpretation of it is that self-esteem is the ability to recognise one’s qualities and self confidence is the ability to recognise one’s skills and abilities in doing something. I often encourage my clients to first work on their self-esteem as I see it as the door to having more confidence. When I ask my clients how confident they feel on a scale 0 to 10, at first they rarely reach further than a 6 or 7 at the best. And when we explore what stops them from being confident up to a 9 or a 10, one of the first answers I get is “If I’m too confident I’m scared of becoming arrogant.” sounds familiar? 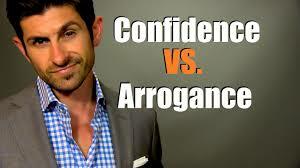 Therefore it’s quite important to explore the differences between arrogance and confidence. How would you describe the difference? After having asked that question to many clients and to my NLP course students over the years, I noticed that the difference can be summed up in a simple statement: Being arrogant is stating your strength and qualities whilst putting down the interlocutor, whilst being confident is simply acknowledging your strength and qualities. Hence the main difference between being arrogant and confident is the intention behind the statement you make. It is also very interesting to notice that most people who come across being arrogant are in fact quite insecure and the arrogance is often a smokescreen or a coping mechanism to hide those fragilities. I’m interested to hear your thoughts on that topic; Do you have another way to explain the difference between the two? I’m looking forward to engage in a fascinating discussion with you, so please drop me a line in the comment section!